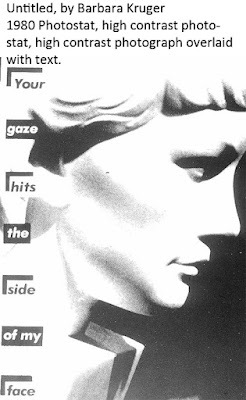 There are two works of art by artist Barbara Kruger that are as relevant today as they were when they were created in 1980s and should be part of everyone’s vocabulary of known works of art. In terms of her historical context, Kruger is probably the inventor of what we call today as “memes.” Kruger is probably the first artist to embrace the idea of collaging text and historical image as a way of sending a message rather than creating an advertisement. I suppose that this is at the heart of what Kruger was about was she was propagandist in some ways for fairness and reasonableness in a most basic way. She believed that a feminist agenda and an antifascist agenda were appropriate subject matter for great art. Today, if she were to publish her work it would probably be lost in the flood of political memes we see on Facebook. She was also commenting and warning about consumerism and materialism. Although these two works were labeled or titled “Untitled,” and then refer to them by the text in them. 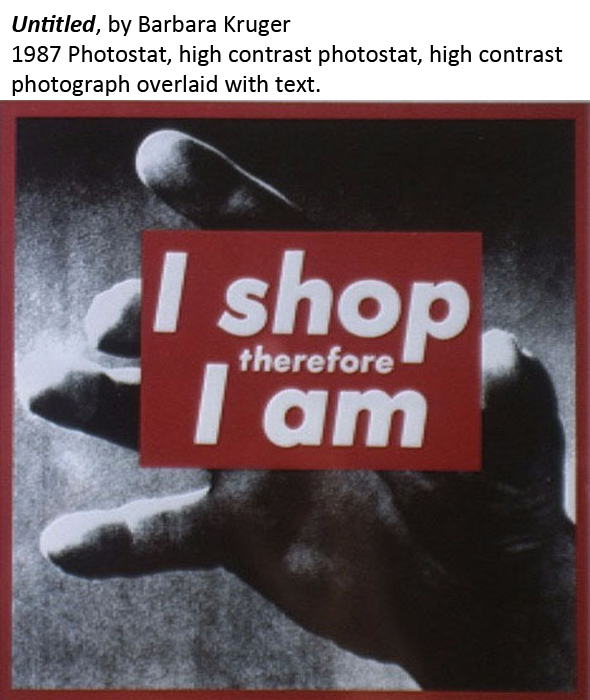 The formal qualities of “I shop therefore I am,” are pretty simple it’s a contrasty black and white photo that even in the 1980s would have looked dated. It has a sense of nostalgia from the 1950s. The Bureau that consumer culture began. The red text placed on top of it sort of modernizes it or brings it up to date with the 1980s and the technology of printing at that time. The combination of the text “I shop therefore I am,” and how it relates to the philosopher René Descartes, “I think therefore I am.” Is just meant as an irony about how we view ourselves because a lot of us feel as if the things we own make us who we are or at least make us think we are who we think we are. Relating it to the 1950s and then into the money glut of the 1980s is just a way of updating the message that what you own is not who you are. In the other piece, “your gaze hits the side of my face,” Kruger is doing the same thing in terms of juxtaposing or contrasting text with a nostalgic image. However, the sculpture that is represented here is actually a piece of Nazi fascists sculpture from World War II. This brings in not just the idea that fascism is wrong but that Nazis and fascists are antifeminist in some way because they believe in an unreal ideal of both humanity and femininity. The text itself is kind of self-explanatory, however some men might not get it, the idea that very often men harass women simply in the way that they look at the woman and the parts of the woman they look at. In this age of Donald Trump, many of Kruger’s messages are as relevant as they were in the 80s but it’s kind of sad that were still doing the same crap.